Late in life, Leonard Bernstein reportedly lamented among friends that he was known only as the composer of West Side Story. "Better that than only being known for A Quiet Place," commented one wag. Now, 35 years after its Houston Grand Opera premiere drew disastrous reviews, his 1983 opera A Quiet Place is being fitfully rehabilitated by opera companies and orchestras around the country and the world as one of the composer's most ambitious works. Curtis Opera Theatre presents the staged premiere of a new chamber-size version Wednesday at the Kimmel Center. "It's such a brilliant work, the culmination of what he accomplished and the culmination of his gifts as a composer," said Garth Edwin Sunderland, vice president of project development and senior music editor at the Leonard Bernstein Office. Yet Bernstein also rebelled against everything he knew. The effervescent tunes of Candide and idealistic lyricism of West Side Story are long gone in this turbulent portrayal of corroded American suburbia and its story of a family separated by chasms of anguish. "None of us can talk to anyone," says one character. "Not even now." Characters seem plucked straight from their front lawns without any literary laundering. Certainly, no opera has a leading lady who sings, "I think I'm gonna pee!" Always eclectic, Bernstein cast his compositional net even wider than usual for A Quite Place, with modernistic tone rows, intentionally vulgar burlesque, an extended quote from the Mendelssohn Violin Concerto, and an orchestration using electric guitar and synthesizer. Dramatically, the opera explores emotional territory similar to A Long Day's Journey into Night and The Glass Menagerie, says the production's stage director, Daniel Fish, who assigned his Curtis cast to revisit the film Ordinary People. Curtis Opera Theatre’s production of Leonard Bernstein’s “A Quiet Place” with 2016 Curtis graduate Jean-Michel Richer as Francois and Siena Licht Miller as Dinah (on bed). Such characters demanded volatile, unstable music. "Lenny was a real adventurer," said the opera's librettist, Stephen Wadsworth, now one of the country's most respected opera directors. "A Quiet Place came from our shared sense of what the next step in American musical theater and opera needed to be. He needed to break new ground." Bernstein challenged himself right up to his death in 1990 at 72, but never on the scale of A Quiet Place, one of the chunkiest of his works. The question this new version poses is whether the opera is better off without chunkiness. Initially conceived as a sequel to the 1952 jazz-inflected chamber opera Trouble in Tahiti, A Quiet Place revisits the suburban couple whose lives look perfect but feel desperate. The sequel begins with the 1950s mom, some 30 years later, driving drunk and off a bridge. The funeral brings together the gay, mentally ill son and his caretaker sister, who has married her brother's boyfriend. It's complicated and candid — incestuous fantasies and all, that are hard to hear but that were even harder to write. During the composition, Bernstein took to bed for days at a time, sometimes seeming to wrest the opera from his psyche. Insiders speculated that he would never finish. Some saw the aging Bernstein, who always seemed to have a drink in his hand, as shattered by the cancer death of his wife and creatively waning. But not in Wadsworth's view. "Lenny was a heavy drinker of watered-down scotch," he said. "He had three cigarettes burning at the same time but in different parts of the room. I saw him daily for several years. I don't remember him ever being even vaguely out of it. I made an early rule not to hang around for the parties … that's not why I was working with him. I didn't need to go to those parties for any reason." Photos at that time show a leaner, healthier Bernstein than only a few years later. 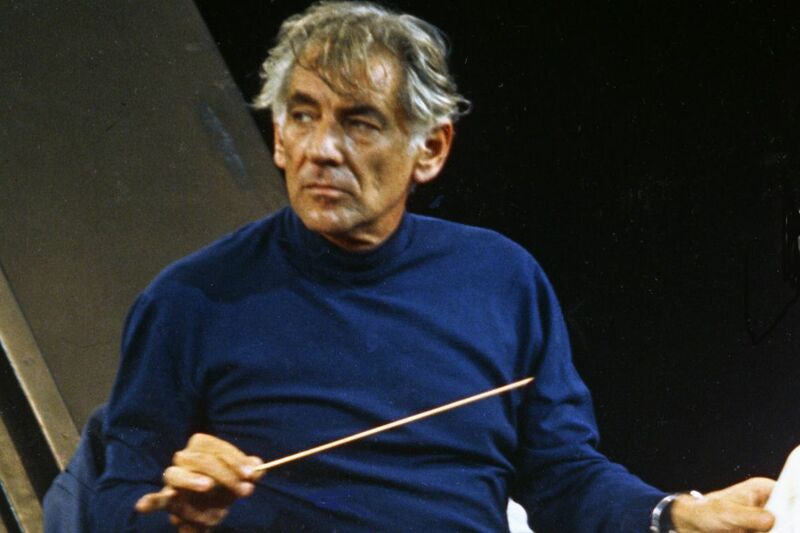 Leonard Bernstein conducts the Curtis Symphony Orchestra with soloist Susan Starr in a 1984 performance at the Academy of Music. At the Houston premiere, Trouble in Tahiti was Act I and A Quiet Place was Act II. Some reviews were encouraging, though the New York Times called it "a pretentious failure." Conductor John Mauceri offered a second wind by suggesting that Tahiti scenes be embedded into A Quiet Place as flashbacks. That version was recorded under Bernstein's direction in Vienna in 1986. "We believed that we nailed it," said Wadsworth. The opera still needed time to sink in — both for listeners and performers. "To learn, to understand, to sing … none of it was easy [in 1986]," said soprano Angelina Reaux, who was in the Vienna ensemble and who has revisited the music over the last year. "Now, I see the depths of the fragility, both for these characters and in most families. They're so breakable. And so broken." Even after an acclaimed 2010 New York City Opera production, however, A Quiet Place was seldom seen. As the current Bernstein centennial approached, the 1986 version had few takers. Waiting in the wings was Sunderland's less-daunting chamber-size version — minus the Tahiti scenes and electric guitar — created in 2013 with an ear for practicality that also included undoing some revisions made between 1983 and 1986. "This is an alternate take on the material and not intended to replace the 1986 version," said Sunderland. A recording of it will be out this year. With the Perelman Theater as an ideal venue, Curtis Opera Theatre artistic director Mikael Eliasen landed the staged premiere — Bernstein being one of Curtis' more illustrious graduates — in partnership with Opera Philadelphia and the Kimmel Center. The opera's initial failure doesn't faze Opera Philadelphia music director Corrado Rovaris: "That means nothing over the long term. I hope this is an important step for the opera." Curtis Opera Theatre’s production of Leonard Bernstein’s “A Quiet Place” with (from left) Jean-Michel Richer, Dennis Chmelensky, Tiffany Townsend, and Adam Kiss. Sunderland didn't make any of his decisions lightly. He talks about the libretto's rich psychological detail, and perhaps puts his finger on what makes the opera so beloved by its advocates but so confrontational at first encounter: It doesn't maintain a safe distance from its beholders. "The first act makes you feel you're at a funeral that you don't want to be at. It's grueling. It's supposed to be grueling," says Sunderland. "But by the end, we're going to redeem it." The bigger question is whether A Quiet Place can stand on its own without Tahiti. "It's powerful to see what the family was like 30 years before. You can see what they've become," said James Mahady, another member of the 1986 Vienna ensemble. "There's a forgiveness for what they've come to." Director Fish, who describes his approach as abstract minimalist, isn't one to look over his shoulder at the earlier opera. "Rather than trying to explain it to them, we're saying this is where it's set, and, hopefully, the production will give enough images … to put the audience in a dialogue that allows them to find their own meaning in the piece," he said. "And whatever story they find is the right one." In all versions, Bernstein's hybrid language remains challenging, always testing the performers' sense of rhythm and the conductor's ability to make such a far-reaching score cohere. "He's always giving you instructions," says Rovaris, referring to the composer's practical notes written into the score, "and he's always right." What nobody can explain is Bernstein's incongruous Mendelssohn Violin Concerto quotation that sails into A Quiet Place seemingly out of the blue. Bernstein just lets it flit around for a while. Then it flies off like a moth. What does it mean? "Why don't you ask him?" Fish suggested with a bit of sarcasm. Considering what a presence Bernstein is in this centennial year, would anybody be surprised if he answered? Curtis Opera Theatre performances 7:30 p.m. March 7 & 9, and 2:30 p.m. March 11 at the Perelman Theater, Kimmel Center, 300 S. Broad St. Tickets: $25-130. Information: 215-732-8400 or operaphila.org.